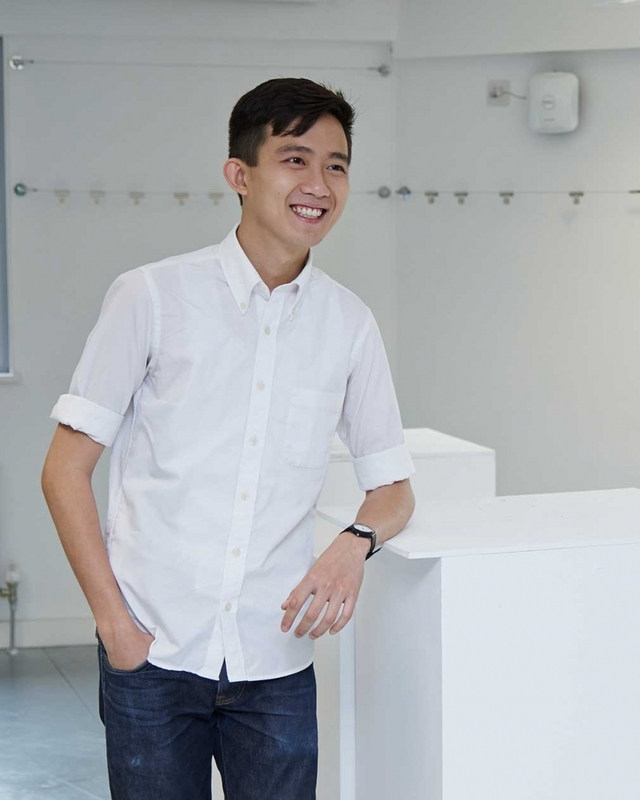 After completing his National Service in Singapore, Mark Ng joined the creative community at NUA on BA (Hons) Graphic Communication. Despite the time away from his practice, Mark knew exactly what he wanted to achieve with his time in the UK, and the reasons why Norwich was the right place for him to realise his ambitions. Now an NUA graduate, Mark gave an interview at the beginning of his final year at NUA about his time in Norwich and the future. You came to NUA after completing a diploma course in Singapore. Why did you decide to train in the UK? The UK was the most appropriate for me. I knew I didn’t want to go to Australia and America was out of the question because it’s too expensive. Obviously there are big name UK universities, but compared to three years in London, the price of living in Norwich is cheaper. I have friends who study in London and they say the same thing: London is really busy and the people can be rude. I’m not too bothered by that, Singapore can be like that, in a way. But you can immerse yourself in an ‘Asian bubble’ when you go overseas. I know a lot of people that study overseas and they just end up hanging out with Singaporeans. They have this mini-Singapore and they don’t get exposed to English people. What’s the point of going all this way to hang out with people that you can hang out with back home? I’m the only one in my year that is Chinese, so I have to hang out with a bunch of people from a different culture. How have you adjusted to life in the UK? One of the things I’m still adjusting to is doing laundry, settling bills and finding housemates. I’m a grown adult and have to do these things, when all I want to do is go home and ask my mom to cook me dinner. I would say outright: I procrastinate. I always need someone or something to push me. I’m getting better at it because I’m here. Even if I don’t want to do work, I can do other things – like clean my room – and once you start doing that you think, I might as well do work. There are important differences in the way art and design is taught in the UK versus other countries. What have you noticed regarding the learning experience at NUA? It isn’t such a difference for me, because I come from a graphic design background and the main thing they tell you is to keep trying. What I do realise is that the tutors here just point you in the right direction. They won’t spoon-feed you. I would say that English people tend to be more upfront with sharing ideas and discussing projects. I come from doing a three year diploma in Graphic Design and a lot of students here don’t have that much experience. In that sense I find myself sharing a lot with them. But I also do learn a lot from them! I had this conversation with one of my classmates who felt that one of my projects this year didn’t hit the mark because of one thing. It was a project for an agency and I was so preoccupied with making it professional that I forgot to make it fun. He said the main thing about all my projects is that they are fun and interesting. But I sold myself short in that sense, because I focused on one thing too much and I didn’t do the other thing. I needed him to tell me that. Graphics is a diverse professional field. How have your studies affected the way you see your practice and your future in the creative industries? Graphic Communication is like the middle point between Graphic Design and Fine Art, because a lot of the time the things that we come up with look arty but they are still graphic design. The main difference is probably that Fine Art is about getting your idea across, whereas Graphic Communication still has a target audience. It might be a client, but there is someone you’re creating for. A good designer doesn’t make it personal at all. The design depends on the situation. There’s no one size fits all. You do have your personal style, but when it comes to designing something for a client, you have to push it aside. If your style fits, then that’s all the better for you. If it doesn’t, then you shouldn’t try to force it to fit. Graphic Designers fall into categories. You’ve got branding for advertising companies, you’ve got web, print and publishing, you’ve got so many kinds. But obviously you can do everything. It’s about specialising, so you can be the best at that one thing. I started out doing print/publishing and I was really interested in doing those kind of things. Then I realised there are fewer and fewer companies printing stuff on paper. I also got more interested in digital media – probably because my brother is a programmer. Right now I’m focusing on learning about digital techniques. One of the main things about Graphic Communication is that we are encouraged to explore digital media and new technology. In your final year, what do you hope to achieve? When I started, it was two years since I studied design because I was in the army. So I came in with a pure goal – to do digital work. I wouldn’t say I’m an expert or anything but I learned how to code and how to make websites and most recently I learned how to design and make an actual iPhone/Android app. It’s really interesting and there’s a lot to learn. But I have these skills from the past – in printing and publishing – and I haven’t been able to show that. What I’m planning to do for the final project is to show all my skills and to make something that will get me a job. I want to work for a digital agency, designing user interfaces and user experience. But to be realistic, I don’t know if I have enough experience. Ideally I would work for an agency, but my main goal is to get a job. You’ve got to start somewhere and the UK is the place to get experience. Norwich is great. It’s everything I thought an English city would be. Quiet, nice, friendly people, cafes, pubs, pubs – more pubs! In a sense, it kind of reminds me of my neighbourhood back home in Singapore: quiet but lots of people and you have everything you need. I’ve been in London three or four times and it’s not that I don’t like it, but I’m the kind of person who just wants to see friends, go to the pub and have a pint. I can do that here. "Norwich is great. It kind of reminds me of my neighbourhood back home in Singapore: quiet but lots of people and you have everything you need."